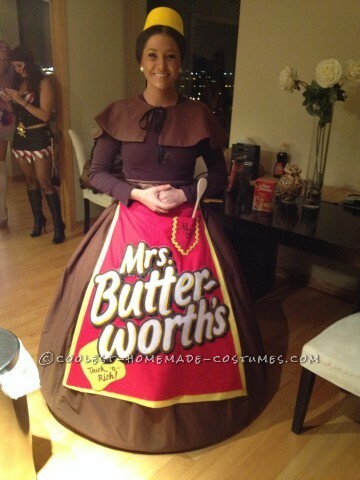 Who Does a "Butter" Homemade Costume than Mrs. Butterworth? Who Does a “Butter” Homemade Costume than Mrs. Butterworth? I came up with this Mrs. Butterworth costume idea because I am absolutely the biggest fan of pancakes and maple syrup, so I thought, “why not be the very thing I love the most, Mrs. Butterworth!” I thought it would be neat to make my makeup look bronze and I couldn’t wait to make a custom apron! That is made from a rubber foam that I cut down and lined the bottom with a layer to look like the snap part. I then took acrylic paint and painted horizontally on the top of the hat to look rounded, then I painted the strokes downward on the base of the hat to look like the grooves in the original cap. I then hot glued two pieces of brown ribbon to tie behind my bun so it stayed on. That was made from brown silk (underlay) with the top being brown cotton. I how glued both pieces together and then folded them at the edge to give it a nice smooth edge and glued it on the underside. that is made of elastic and brown cotton fabric (this was purchased) however, was homemade. The underlay is a hoop skirt that was also purchased (a three ring hoop skirt to be exact). This was entirely hand made. I started by taking a picture of the bottle with a high resolution camera. I then took that image into Photoshop and subtracted all the design, except for the letters of “Mrs. Butterworth’s” and “Thick and Rich”. From there, I enlarged the picture and printed it off. I cut out all the letters, pieced them together and then cut each line out individually (Mrs., Butter-, Worth’s). I then outlined that onto white fleece. I then cut out the most outer layers and started to cut out the black edging (trace that onto the felt), cut out the brown edging (trace that onto the felt), and cut the yellow edging (trace that onto the felt). Once I was done with creating a “paint by numbers” for the lettering, I painted the yellow, black and brown in acrylic and let that dry. I purchased an apron for shape and dyed it red. Once I realized it was not dyed dark enough (red) I decided I would have to go out a buy a red fabric. I then placed the red fabric over the dyed apron and began to shape the apron into the classic shape of the Butterworth apron. I ironed everything to make it as clean cut as possible. From there I hot glued the apron to shape and began on the yellow edging. I cut out strips of 2-3 inches and then glued the edges together, then attached those to the back of the apron on the sides and the bottom of the skirt. Once the letters were finished drying (overnight) I hot glued them to the front of the apron. I then created the pocket (which IS A pocket) out of the same red fabric. I then lined that pocket with a yellow ribbon and drew the “MB” with a fabric marker. I then cut out the (butter) from the same yellow fabric from the edging and wrote out Thick + Rich with the fabric marker. I then hot glued my skirt to a sash of silk fabric for the sash and the apron was finished! Was this costume easy to walk, sit or go up stairs in? I wanted to make it for my little girl and yours is by far, the best! AWESOME! I thought I was good but people here always blow me away! The lettering is so amazing. You must have a career in a creative field! This should win a prize!